Ep. 61 What is an advance parole? It allows people to re-enter US after traveling overseas without an immigrant visa. If you leave without a visa, you can’t go back unless there’s a permission to travel which is advance parole. It preserves the adjustment of status application that is pending in USCIS. Today, I wanted to answer a question that involves an advance parole. What is an advance parole? The term is … you hear that when you are applying for your adjustment of status cases, you hear this when you actually have a need to travel out of the country. Advance parole is actually a document for certain people that allows them to re-enter the United States after traveling overseas without an extra visa or – an immigrant visa or known immigrant visa. Such immigrants must be approved for advanced parole before leaving United States. For example, when you file for an adjustment of status 485, you file an application on form I-131 for advance parole with it. Generally, if an immigrant has not obtained an advance parole before leaving, he or she will not be allowed to re-enter back to United States when it’s a very, very important document. 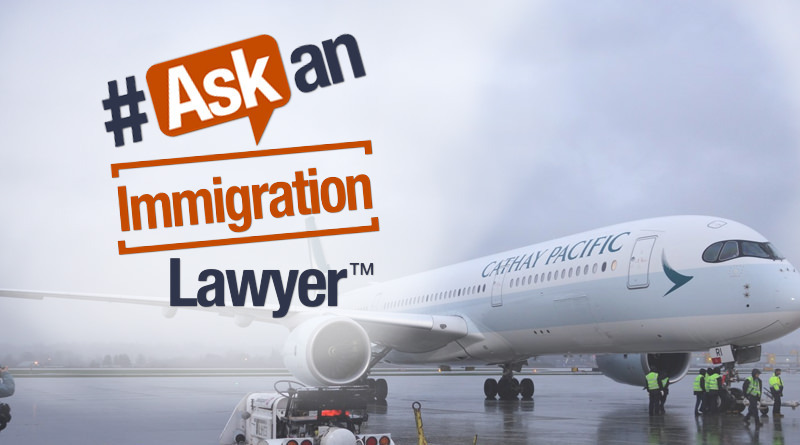 Because typically, if you leave without a visa, you can’t go back unless you have a permission to travel which is advance parole. Examples of people that may need it: people who go through an application for adjustment of status 485 – they need parole. If you’ve been admitted as a refugee or asylum, you need a parole to come back. If you’ve been given benefits under the family unity program, you get a parole. If you got a TPS, Temporary Protected Status, or an asylum is pending at this moment, these categories require an advance parole. Some of the things that you need to know about it. First of all, it allows you to come back to the US. It’s a very important benefit that you actually can go back to the US. But most importantly, it actually preserves the adjustment of status application that is pending with the USCIS. It is important because as you file the adjustment of status, if you’re here on a visa let’s say on an H or L, you don’t need this but any other situation, if your visa expires or you lose your position, you need to have an advance parole to be able to come back to the US. Some people were wondering what happens if say somebody came to the United States, they overstayed and then they married a US citizen and filed for adjustment of status. Can these people apply for parole and leave the country? Well, under the current regulations, yes, you can apply for parole even if you overstay the visa before getting the green card, and even if you depart the country under certain circumstances on the certain case law that came about recently, certain people will be able to return to United States even after an overstay and departure with an advance parole. Again, typically I would not recommend to somebody who overstayed and has an adjustment of status application pending to leave the country even with the parole, but it could be a possibility in some cases especially under the current laws. How long does it take to get one? From filing the I-131 about three months, two to three months. Typically these advance paroles are valid up to one year. Hopefully within that one year, either you get your adjustment of status or you can file for a renewal. Hopefully it was helpful information about advance parole. If you have any other questions, please remember that we are not your attorneys. We don’t represent you. This is just for general information. If you do have an issue, if you do have a complicated matter, please always seek the council of an experienced immigration lawyer. Thanks for listening. You ask, we answer, simple. We’ll see you at our next episode.